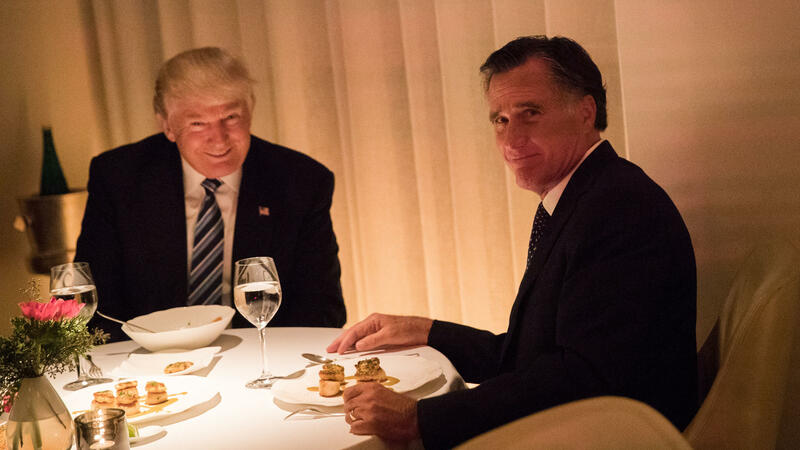 President-elect Trump and Mitt Romney dine at Jean Georges restaurant in November in New York, as Trump considered Romney for secretary of state. Mitt Romney's Twitter feed had been hinting at a possible run, changing his location from Massachusetts to Utah and teasing an announcement two weeks ago. Mitt Romney, the 2012 Republican presidential nominee and former governor of Massachusetts, officially announced Friday morning that he is running for the Senate seat being vacated by seven-term GOP Sen. Orrin Hatch of Utah. Romney tweeted a video announcement, after delaying a planned launch on Thursday in the wake of the deadly mass school shooting in Parkland, Fla.
Romney, who spoke out forcefully against Trump during the 2016 presidential campaign, blasted Washington and took veiled swipes at the president in the video. "Utah welcomes legal immigrants from around the world," Romney says. "Washington sends immigrants a message of exclusion. And on Utah's Capitol Hill, people treat one another with respect." 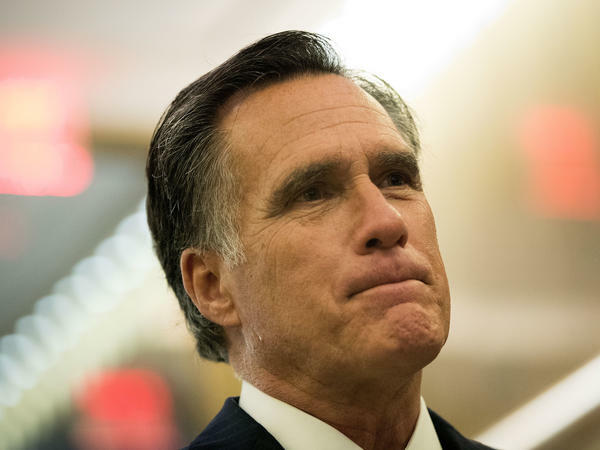 A Sen. Romney would add yet another layer of drama to Washington. During the 2016 campaign, Romney called Trump a "phony" and a "fraud." Trump, who tried to persuade Hatch to run for re-election, responded hotly during the campaign, saying Romney "would have dropped to his knees" for Trump's endorsement in 2012. From afar, Romney has been critical of Trump's policies. Now, he has the opportunity to do it up close — and with a likely national television spotlight, if he seeks it out, that will beam him right into the White House, in plain view of this president, a habitual cable-news watcher. Romney's announcement was widely anticipated after Hatch, the longest-serving Republican senator in U.S. history, said in early January that he was calling it quits after 42 years of service. Hatch told The Salt Lake Tribune that he was urging Romney to run. Romney is seen as an early favorite to win the Senate seat, but not every Republican in the state is happy he is running. He is facing criticism from, of all people, the state Republican Party chairman. "I think he's keeping out candidates that I think would be a better fit for Utah," Rob Anderson told the Tribune, "because, let's face it, Mitt Romney doesn't live here, his kids weren't born here, he doesn't shop here." Romney was governor of Massachusetts, where he was registered to vote and ran his private investment firm, Bain Capital. He also has lived most of the time at his beachside home in San Diego. But Romney also owns a home in Park City, Utah, and has close ties to the leadership of the Church of Jesus Christ of Latter-day Saints. In addition to serving as a missionary for the church in France in the 1960s, he has held several leadership positions, including lay bishop. He is probably the most prominent Mormon in the country. Perhaps to combat the carpetbagger critique — and to assure voters of his focus in running for the Senate — he mentions Utah by name 14 times in his announcement video. Another potential critique is that the 70-year-old might use his potential national platform to run for president again in two or six years. Bolstering his case to run, Romney has consistently been regarded as one of the most popular politicians in the state. A poll from November, for example, showed him with a 69 percent approval rating. Early Senate race polling has shown Romney comfortably ahead in hypothetical matchups against Democrat Jenny Wilson, who currently sits on the Salt Lake County Council. Romney ran for the Senate in Massachusetts in 1994, losing to Democrat Ted Kennedy. He was elected as the state's governor in 2002. In the interim, Romney stepped in to turn around the scandal-plagued 2002 Salt Lake Winter Olympics, which vaulted his reputation in Utah. His connection to his church has also been key. In fact, that connection goes back generations. Romney's great-great-grandfather Miles Romney was a Mormon pioneer, who settled in Utah in the 19th century and designed the famed St. George Tabernacle. In 2012, Romney won nearly 73 percent share of the vote in Utah, soundly defeating President Barack Obama there by 48 points. Contrast that with the 2016 presidential race. While Donald Trump won Utah, he only received 46 percent of the vote. Many Utahans, fueled by their growing unease with Trump's divisive rhetoric, instead cast their vote for Evan McMullin, a third-party candidate and a Mormon, who got 21 percent. Romney's stature in the GOP and history of criticizing Trump create the potential for a powerful Trump Republican critic coming to Washington as others like Sen. Jeff Flake of Arizona retire. "If that happened, Romney would immediately become the most prominent elder statesman of the GOP. Dignified and disciplined, the 2012 Republican presidential nominee would become the center of gravity for those in the party who are uncomfortable with Trump's behavior." After clashes between white nationalists and counterprotesters turned deadly in August in Charlottesville, Va., Romney was critical of the president's early response in which Trump said there was "blame on both sides." Romney condemned Trump's response in a Facebook post, saying Trump's comments "caused racists to rejoice." He also criticized Trump's reported vulgar comments about African nations and Haiti last month. During the 2016 campaign, Romney excoriated Trump by delivering a speech at the University of Utah. "Here's what I know. Donald Trump is a phony, a fraud," Romney said, later adding, "He has neither the temperament nor the judgment to be president. And his personal qualities would mean that America would cease to be a shining city on a hill." Trump returned fire, accusing Romney of being willing to do anything for his endorsement in 2012. "He was begging for my endorsement," Trump said. "I could have said, 'Mitt, drop to your knees,' he would have dropped to his knees." Still, after the campaign, Romney was floated as a possible secretary of state candidate for Trump. The two met during Trump's transition into the White House to discuss the role. No offer materialized, but Romney was photographed looking on awkwardly. When Hatch announced his retirement, amid much speculation about Romney's run, White House press secretary Sarah Huckabee Sanders was asked whether Trump would commit to campaigning for the eventual GOP nominee. "I don't think we've made a determination in terms of campaigning, but the president certainly has the greatest and deepest amount of respect for Sen. Hatch and his over four decades of experience in the Senate," Sanders said at the time. Months prior to Hatch's announcement, Trump publicly and privately tried to persuade the 83-year-old senator to seek re-election this year. The president showered Hatch with praise at a Salt Lake City event in December. "You are a true fighter, Orrin," Trump said. Another time, the president said he hopes Hatch stays in the Senate "for a long time to come." With his Senate run, Romney has an opportunity to change perceptions that dogged him throughout his presidential campaign — that he is an out-of-touch plutocrat, detached from the realities lived by many Americans. 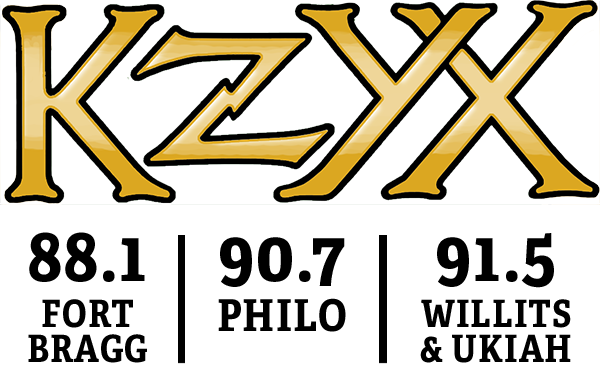 Much of Romney's considerable personal wealth, at the time estimated to be about $250 million, was attained as a venture capitalist in the 1980s as the head of the firm Bain Capital. Romney tried to counter that image by picking a wonky, more energetic and self-proclaimed "young gun" running mate in Rep. Paul Ryan, R-Wis., who was at the time the chairman of the House Budget Committee. As NPR reported at the time, the pick energized some in the GOP base but ultimately did not win him the White House. Ryan is now speaker of the House, and the two remain in contact. Two issues that Romney contended with in 2012, and that still haunt the GOP today, are health care and Russia. Like many Republicans, Romney vowed to repeal the Affordable Care Act, Obama's signature achievement, even though he started a similar program as governor of Massachusetts. And at the time, Romney was mocked for saying Russia was the country's top "geopolitical foe." "[Russia] is, without question, our No. 1 geopolitical foe," he told CNN in 2012. "They fight every cause for the world's worst actors. The idea that he has some more flexibility in mind for Russia is very, very troubling, indeed." Romney appeared to be offering a prescient warning after the Russian efforts to influence the 2016 campaign came to light. But Trump still refers to the idea as a "hoax."